Having changed my pollen filter again, it reminds me how hard it seemed to be to find a guide for doing this, so I’ve disappeared out in the rain to take some photos to create a quick guide to replacing the cabin pollen filter on a Peugeot 206. 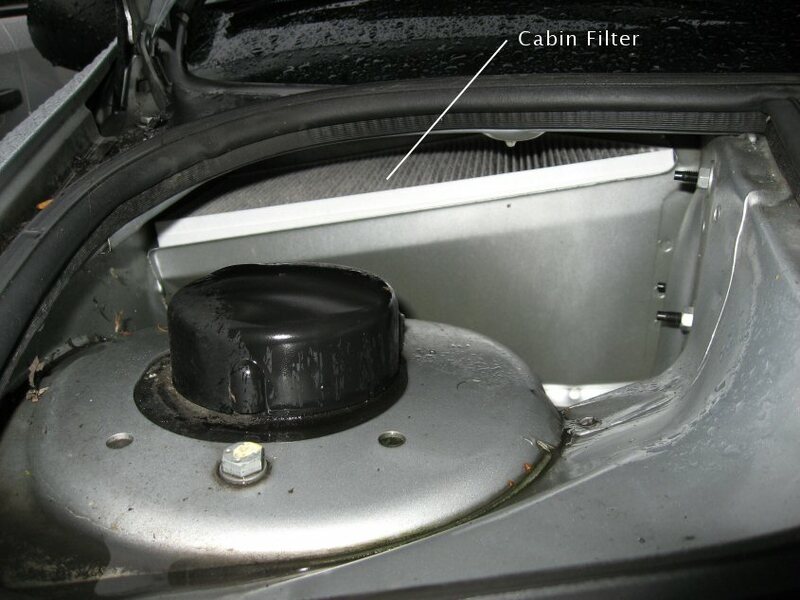 Be aware: The cabin pollen filter is in a tight space, so don’t be surprised if you get your hands on it, but seem to be struggling to work out how to get it out! It is literally sitting in the top of a metal duct, so you “just” need to lift it up and out. I find I have to loosen the edges, and then lift the front, and pull the right hand side out first (basically lift and pull the pointed right end side out). Hopefully the photos below will help. It’s well worth doing yourself rather than paying an expensive garage fee. I’ve bought mine from GSF and EuroCarParts in the past, but actually Amazon now looks to have the best price, at about £2 less than EuroCarParts and GSF at the time of writing (EuroCarParts: £7.29 versus Amazon: £5.42 with free delivery). Approaching the car from the front, with the bonnet open, the cabin filter is up underneath the windscreen, and accessible from the top left as you look at the space under the bonnet. 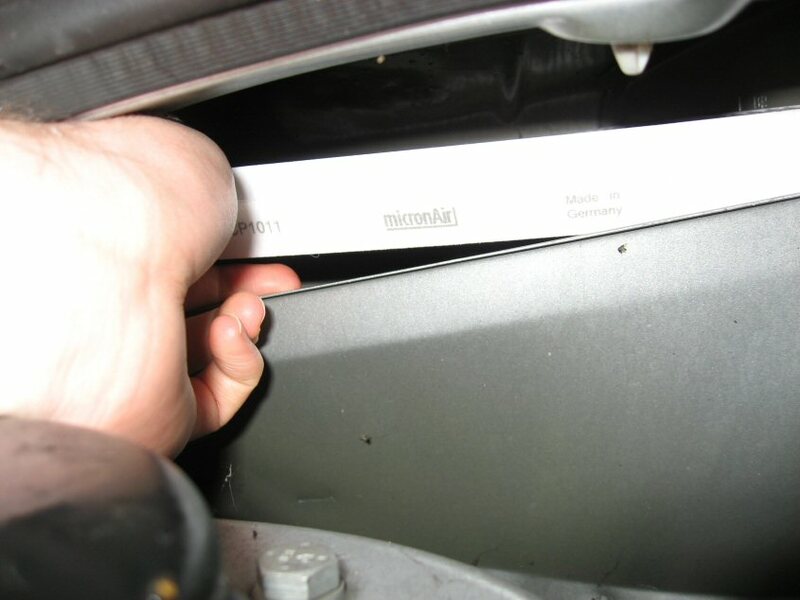 Tucked in the under the dashboard, you can see the top of the cabin filter. Lift the filter from each edge, inc the back, to loosen the filter. It is a very tight space. Lift the front and bring out the front right corner first. I find the front right corner needs to come out first, with the filter being twisted slowly 90 degrees to remove through the gap available. As it comes out of the gap under the bonnet, you have turned it 90 degrees, so the right hand side comes out first. There you go, that’s the filter removed. I change mine every 6 months. thanx for telling the right way to change filter pictures make understanding more easy. Hi! 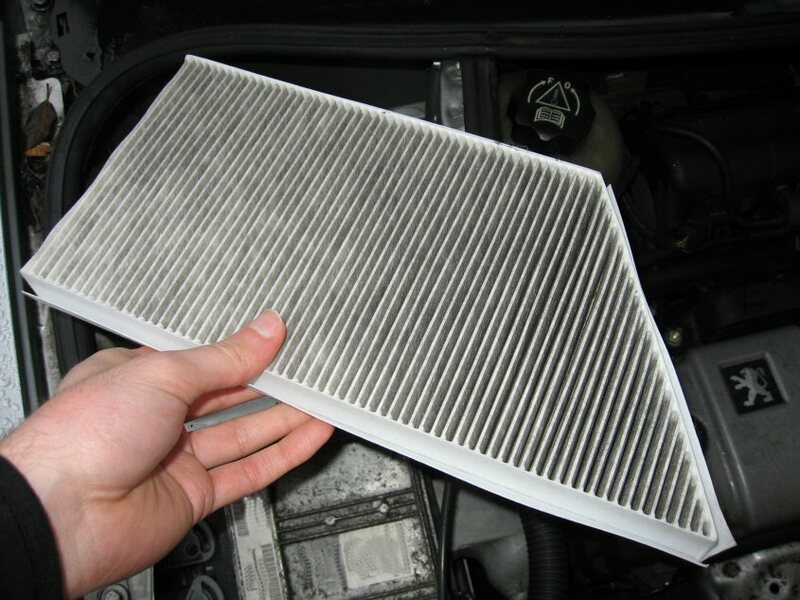 Do you know whether this filter can cause the car to smell a bit funny? i have a peugot 206 and its got an unpleasent smell we just cant shift! 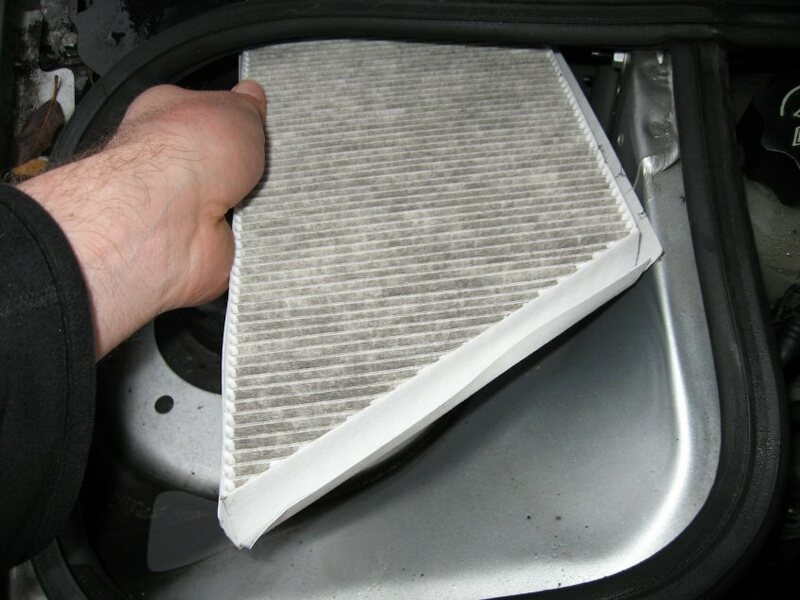 I would say “yes”… logically the air runs straight through the filter… if the filter gets damp and grows mould or similar, it could be driving an unhealthy and unpleasant smell into the car. 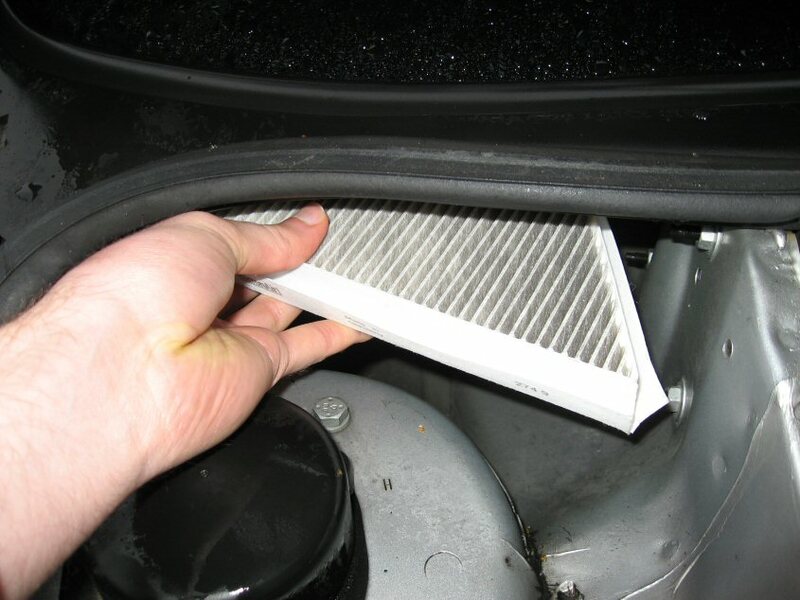 You’ll also get unpleasant smells if the filter is no longer working effectively and preventing proper airflow… you could lift out the filter and take a look/smell it… but if it’s over 12 months old, £10 seems well worth while for a clean and effective filter. Thanks for the helpful photos and instructions, seems like a 5 minute job now! Will this be the filter I need to change when I have antipollution fault? My car when driving it seems to pull back a little bit. Thanks for your question. I’d imagine that if the engine is being impacted, it would be the oil filter that you would need to change. 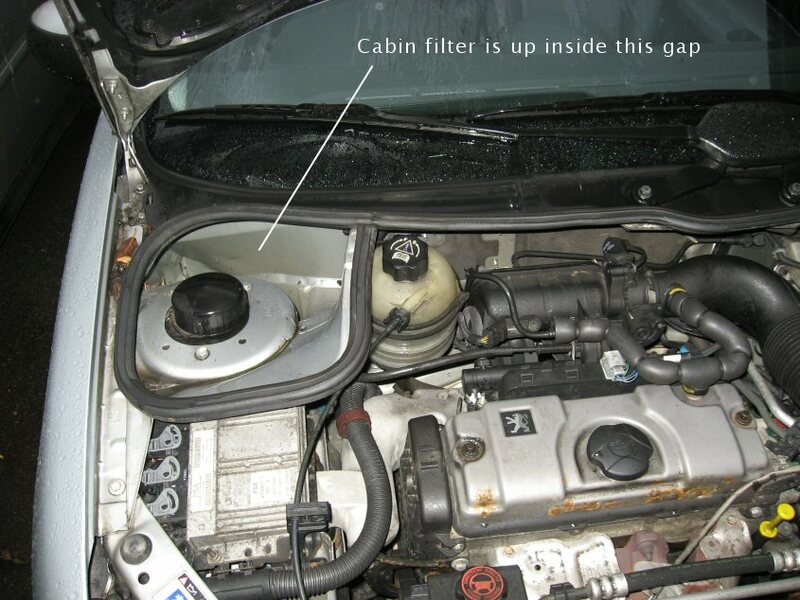 The filter in this article is for the air that comes into the car cabin itself (where you sit). Thank you so much for the information. So valuable and greatly appreciated.